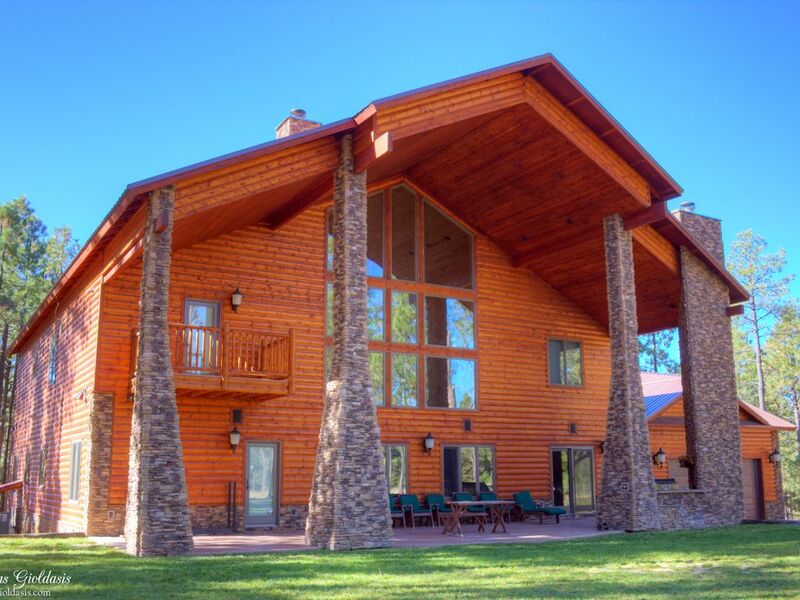 Luxurious custom crafted mountain home backs to USFS & features superior quality finishes. Perfect for a large family. The summer temperatures range from 72-48 degrees. The winter brings snow and sledding, with temperatures ranging from 20-50 degrees. Knotty pine T&G throughout; 2 MASTER SUITES & 4 bedrooms; huge loft and separate TV room (perfect for kids); the expansive open area dinning/living room has an 8 seat horseshoe shaped bar with custom juniper wood bar top, beverage center & ice maker; oversized 2 car garage; 1 gas lit wood burning stacked stone fireplace inside and one outside under the extended back patio and built-in grill. Gourmet kitchen complete with commercial Viking 6 burner gas range with 2 ovens and a pot filler faucet, hand hammered copper double sink in kitchen, vegetable sink/wet bar, built-in microwave & bread warmer, cabinet conversion appliances, Brazilian iron soap stone countertops, breafast bar seats 8 or more, large walk-in pantry; lots of storage. Nuvo surround sound system throughout. 2 regulation size horseshoe pits (fully lighted for night play); outdoor circular fire pit; 15,000 SF of lush grass backyard & children’s’ play ground; basketball court also lit for night play. Kitchenware, new washer/dryer, two 65’’ & three 42’’ LCD TV’s, new furniture throughout + linens. The cabin is located at the top of Mogollon Rim and is using a septic system. Water will not run properly if all showers and tubs are used at the same time. Please take turns! Hot water is available. We have towels and washcloths to accommodate 23. Larger parties will need to bring anything above that, if needed. Parties above 12 will need to supply plastic utensils, and paper goods to eat on. Gourmet kitchen with commercial hand hammered copper sink, vegetable sink & wet bar. Cabin exceeded our expectations. This property is designed for making wonderful memories. Generous and thoughtful owners. Very responsive management. We absolutely loved our stay here and had a wonderful Thanksgiving with our family! Our church spent the weekend at this location for rest, relaxation and rejuvenation. Words cannot express the time that we had. First of all, all of my questions and concerned were answered before arriving. When we arrived, the home is simply beautiful. Everyone was so pleased with the look and feel of this location. (I think I won Pastor of the Year Award with this choice!) We had adults and children and there was plenty of room for us to spend time togther. The playground was the perfect addition for the children to come and go and still be in an eye's view. The upstairs tv room was great for teenagers who wanted to play games and get away from the adults. The rooms were very spacious and had everything that we needed to have a comfortable stay. The kitchen was well stocked and met all of our cooking needs. We planned this trip to cook, eat and sleep together and we did just that! The dining room had enough space for all of us to dine together with out being on top of each other. If you want to detach from the city (Phoenix) as we did, this location is perfect. Some of us went hiking, while others just took the time to sleep, read, fellowship or rest. After a 2 hour 45 minutes drive, it is perfect place to unwind and enjoy nature. We plan to return next year. We had a group of 16 here over Labor Day weekend and everyone had a blast. Giving a highly positive review is tough...because we really don't want other folks to book it before us in the future! This is a really spacious and beautiful property. My group of 14 people had a great 4 days/3 nights at the house. The Owner is friendly and accessible. Thank you for letting us staying at your exceptional home! Great place for our family reunion. The property was beautiful and roomy. We had a family reunion there and didn't feel crowded with 20 of us. We brought our own quads and enjoyed the nearby trails. We brought kayaks and enjoyed a nearby lake. We enjoyed many outdoor activities on the backyard lawn. There are seven cold water lakes in the area; Woods Canyon Lake, Willow Springs Lake, Chevlon Lake, Bear Canyon Lake, Black Canyon Lake and Knoll Lake. Hiking and Mountain Biking is plentiful with all the forest trails. We have a great trail right off our driveway that is a 6 mile loop. We have spotted deer and elk many times on this route. Check-In is at 3:00pm and Check-Out is at 11:00am. An additional event fee of $500 is charged for events held at the cabin (i.e. weddings, etc. ).